Canson has been making fine art papers since 1557 and the company’s grades such as Arches, BFK Rives, and Montval have been used for centuries by the World’s most famous artists for the creation of original masterpieces. 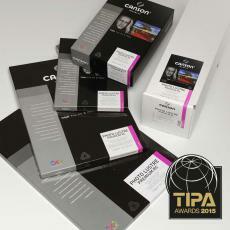 The Canson Infinity division has taken these same historic papers and coated them for use with inkjet printing creating a range of digital fine art and photographic media with a quality that is second to none. The Canon Infinity coating chemistry produces incredible print density and papers with a high white point without the use of optical brightening agents that are known to yellow over time. The range includes several types of 100% cotton rag papers in different surface finishes, glossy and luster photo papers, and museum quality canvas. All grades are fast drying with both dye and pigment inkjet inks. For those new to Canson Infinity range, a discovery sample pack is available that includes letter size sheets of the fine art and photo ranges – see below.